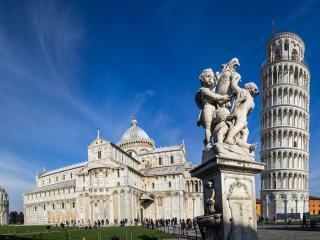 Pisa's landmark the Leaning Tower attracts millions of visitors each year. Despite this fact the tower is only part of Campo dei Miracoli (field of Miracles) where you can visit the Duomo, the Baptistry and Camposanto. The Golden Age of Pisa was from the 11th to the 13th century when it became a strong maritime power in the Mediterranean. 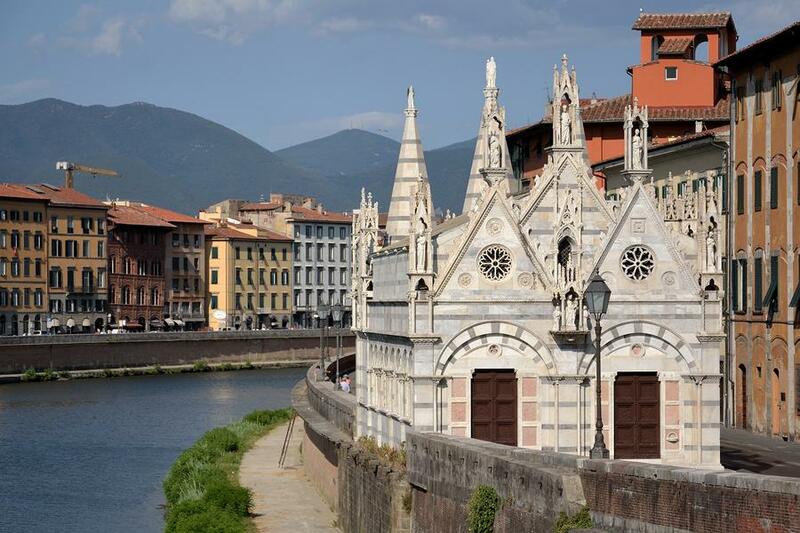 Here you will sample the Pisan-Romanesque style of architecture with its black and white marble facades and medieval sculptures from the workshops of Nicola and Giovanni Pisano. Florence's Medici rulers during the Renaissance period re-established the University of Pisa and Galileo was a teacher at the time. 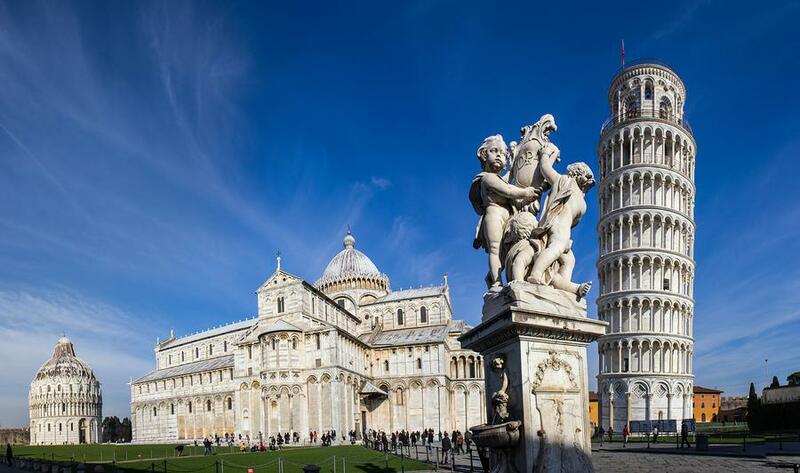 One of the most photographed sights of Italy is the Leaning Tower of Pisa and it is best viewed from Porta Nuova. Work began in 1173 and it is believed that the tower was always tilted. Twelve years later it started to subside in the opposite direction than its current lean. Architects in their efforts to counterbalance the lean added 3 more uneven storeys a century later. Finally in 1350 Tommaso Pisano completed it with a lopsided bell chamber. 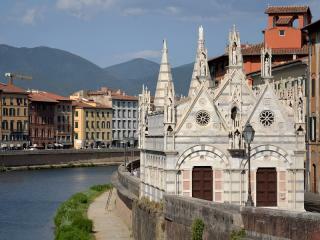 The Duomo is a model of Pisan-Romanesque style with its dark grey marble and white stone. Its construction began in 1064 and it took almost a century to complete. The pulpit sculpted by Giovanni Pisano is one of highlights of the Duomo. The Baptistry, a circular construction is a 3 storey building of Romanesque arcades and it is the largest in Italy. Camposanto is considered one of the most beautiful cemeteries of the world. Legend has it that during the 4th crusade Archbishop Ubaldo Lanfranchi had Pisan knights bring a cargo of soil from the hill of Golgotha back to this city in order for the eminent people of Pisa to be buried in holy earth. The Museo dell'Opera del Duomo contains Giovanni Pisano's Madonna del Colloquio and some beautiful examples of intarsia - the art of inlaid wood which was practiced in Pisa during the 15th and 16th centuries. In the Eastern city quarters you will find lots of Romanesque churches and delightful piazzas and in the west side the Museo Nazionale di Palazzo Reale is worth visiting.